If this naturalista could describe her work in three words, they would be: raw, intriguing, and amorous. A New York native and happily married mother of two, Artist Ria has commanded the attention of the social media community, fascinating thousands of Instagram followers with the standout style of her drawings and paintings. Most of her pieces are centered on the versatility within the natural hair community. “I draw a lot of Afro art but I also draw a lot of abstract work. I guess you can call me an ‘everything artist,’” the artist shared in an interview with 4c Hair Chick. 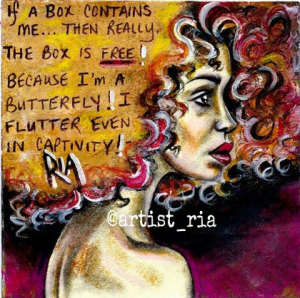 Continue reading my profile of Artist Ria here.